I know I’m overdue for this post (mostly because I’ve had Teapot 3 for a while and have been hiding it from the world), so forgive me if you were dying to know what happens next in the teapot progression. At the risk of sounding dramatic, it’s time to admit failure. Yes, yes–it looks fine, right? Let me remind us that our purpose is to nitpick in order to improve. So let’s criticize away, shall we? (If you are in this for the pictures, or are otherwise uninterested in details of the ceramics process, feel free to skip my explanations.) And before we despair of Teapot 3, I should say that all is not lost. 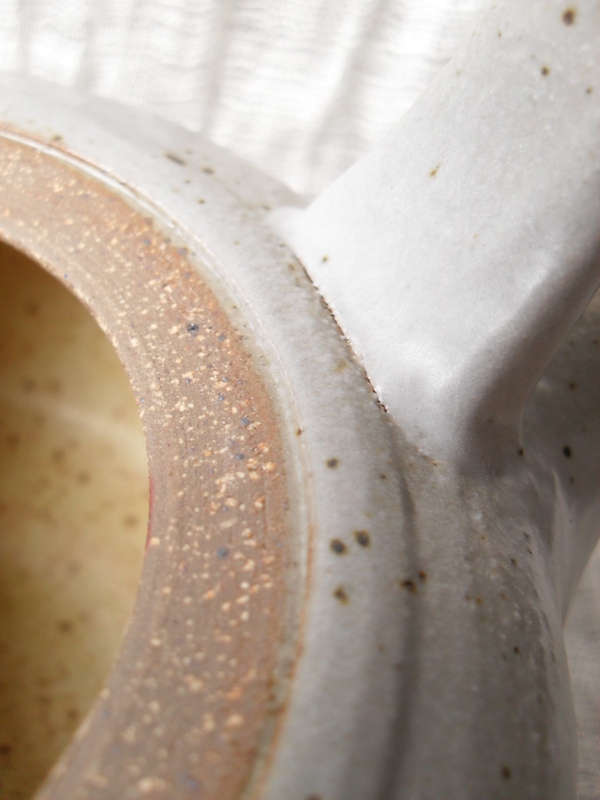 To explain my dissatisfaction, here is a fact: there are several ways to apply glazes, among them dipping into the glaze (your pot goes directly into a bucket of glaze for a couple seconds, then you pull it out and let the excess run off), pouring the glaze into or onto the piece (especially for larger pieces), and spraying. Each has its advantages. 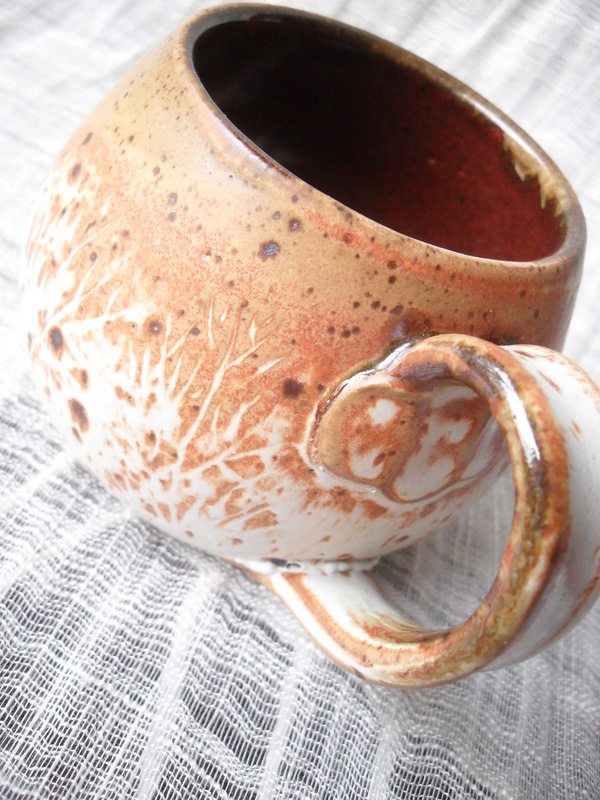 For smaller pieces like mugs where I want a two-tone effect, or a surprising inside color, I will pour-glaze the interior, then dip the outside. Poured inside glaze, dipped outside glaze. 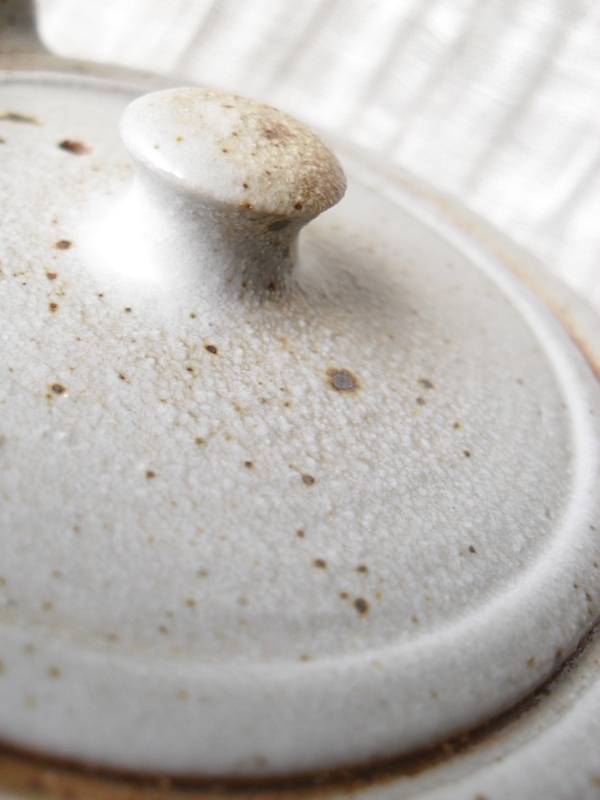 Dipping usually gives you an even coat that is the perfect thickness to cover the clay, yet not so much that it will run down and ruin the piece (this of course depends on the glaze). However, if you want a more subtle color gradation, spraying is the way to go. An example of when spraying works. The green is sprayed over the white. 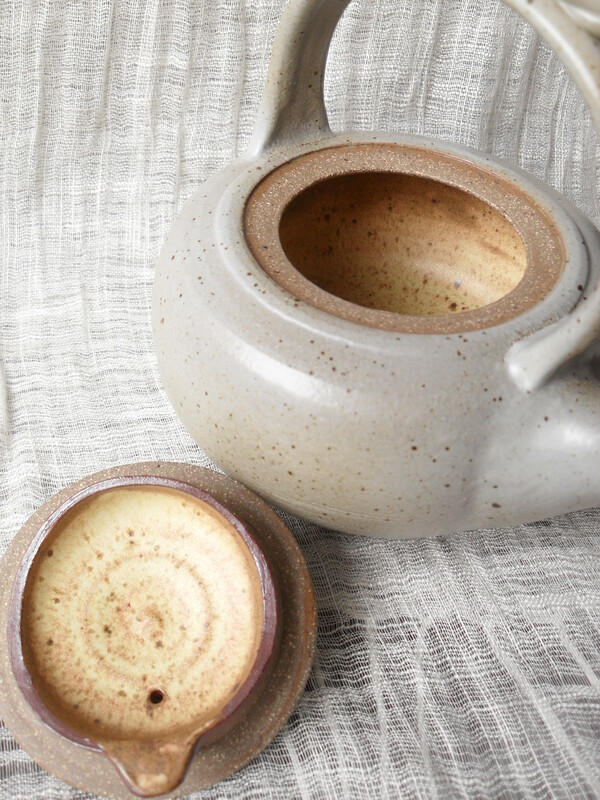 Dipping is hard to do with teapots if you want a different inside color, since it’s easy to accidentally let glaze come in the spout and spoil the inside. On this one, I happened to envision a yellow interior, with a nice smooth gray exterior and a little bit of a red or green detail (like the effect on the above pitcher). So I poured the inside with yellow, then sprayed the outside with gray-white, and a little red over that (the two usually react to create an olive-y green). At least the inside looks nice . . . The result? Boring. Visually, I was unimpressed–but then I touched its surface and my revulsion was confirmed. 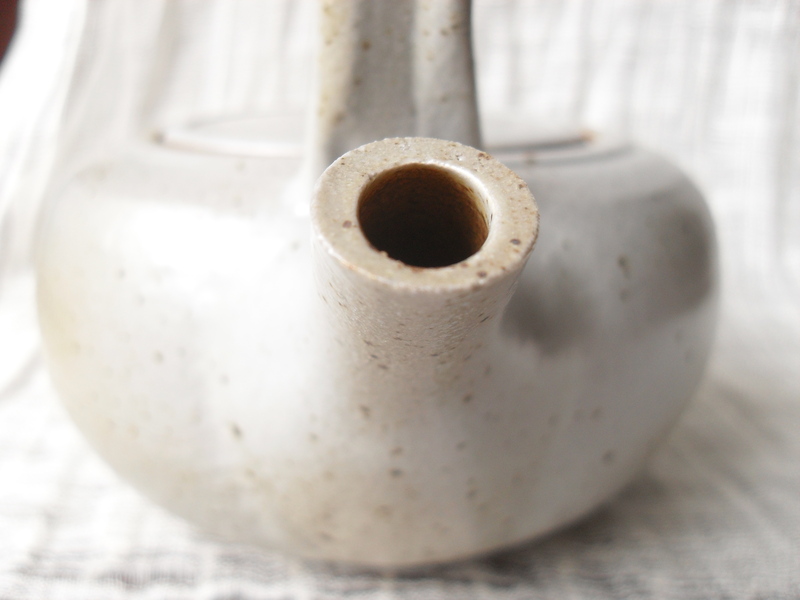 I had good results from spraying my first teapot–see here, but since then I think I’ve applied coats of glaze that were too light, fearing to apply too much and cause running glaze (which sticks the pot to the kiln shelf and is the devil to remove from the bottom of the fired pot). This would be fine if it were just a visual effect, but here’s the problem: the tiny, sprayed particles of glaze–when they don’t have enough other glaze particles around them to melt into–had hardened into little, sand-like, make-your-skin-crawl-when-you-touch-them bumps on the surface (disclaimer: my [dramatic] theory of what happened–not scientifically proven). 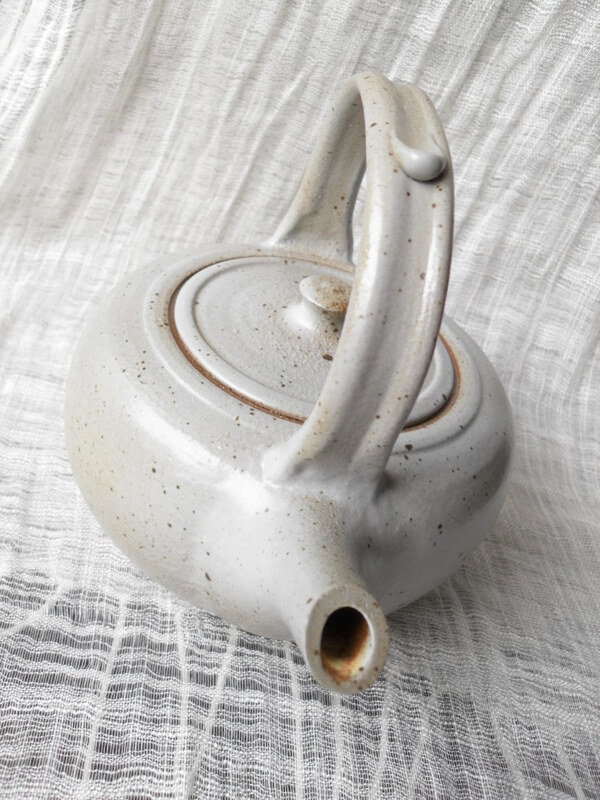 So–I know artists are their own worst critics, but I figure if I pick up one of my teapots (which I love) and immediately shudder at its texture, then someone else will do that too. Slight cracks (!) at the base of the handle. I feel like I have to admit this: this means that I did not attach the handle perfectly. Usually glaze will help cover up (and strengthen) such flaws, but as we’ve discussed, I didn’t put enough on. Sheesh, potter. Did I mention I’m still learning? 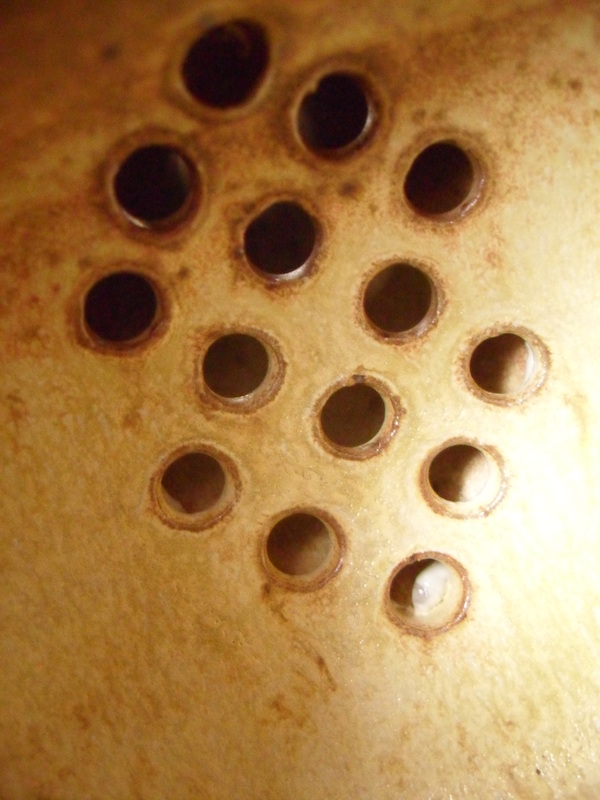 On the positive side, however: the strainer is the nearest-to-perfect I’ve had yet! 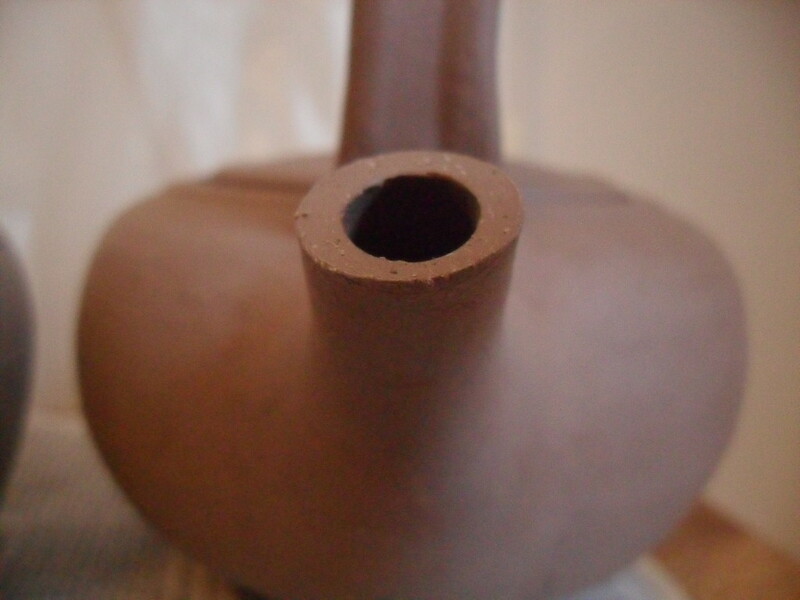 The holes are beautiful and clear of glaze (barring one tiny bubble of it in the bottom-most hole). This will help liquid to flow more forcefully through the spout, making pouring less dribbly, in theory. To conclude (and I’m sorry for the looooong post! ), here’s why I’m not despairing of Teapot 3 yet: I can re-fire it. I’ll apply a little more glaze and let it go through the kiln again, hoping for a better result. Then I’ll talk a lot about that too. Thanks for sticking with me. Hurray for teapots! 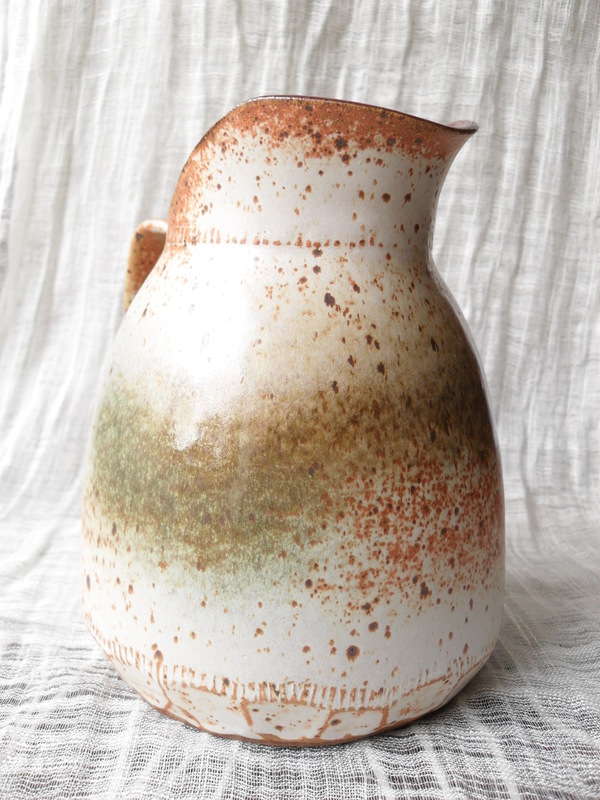 This entry was posted in Glazing and Firing, Hand-Building, Pottery, Wheel-Throwing, Works in Progress and tagged aesthetics, art, beauty, beginning pottery, ceramics, clay, cutting teapot spout, dipping glaze, doing what you love, failure, flaws in handle attachment, gas kiln, glazes, handmade, high-fire, high-fire ceramics, loop handle teapots, pottery, pouring glaze, re-firing, reduction fired ceramics, self-employment, spout angle, spout untwisting during firing, spouts, spraying glazes, stoneware, tea, teapot, teapot design, teapot making, teapots, trying again. Bookmark the permalink.